Editor’s Note: E-Trade has acquired OptionsHouse. Current OptionsHouse customer accounts, assets and positions will be moved to E-Trade on August 4-6. (For more details visit E-Trade’s FAQ.) See NerdWallet.com’s E-Trade review. Sophisticated investors — particularly options traders (no surprise) — get a lot of broker for very little money with OptionsHouse. The firm’s low-cost commissions ($4.95 a trade for stocks and options), $0 minimum to open and maintain an account, and professional-grade research, trading tools and platform earn it NerdWallet’s five-star rating. That said, OptionsHouse is not a one-size-fits-all brokerage solution; mutual fund and exchange-traded fund investors can find a much better fit for their needs elsewhere. Compare OptionsHouse with other brokers. Account minimum and fees: OptionsHouse scores big points for requiring no minimum balance to open an account. Even better — and this is a standout among brokerages that cater to active traders — the company charges no maintenance fees to customers who fail to make a certain number of trades per month or year. Similarly, customers pay nothing extra for the platform or data. Options trading platform and tools: OptionsHouse started as a broker for experienced, self-directed investors who were active in options, and it still offers professional-grade tools and execution at a low price. The company’s merger with TradeMonster in late 2014 and full integration in 2015 made a big impact, with OptionsHouse taking on that company’s highly regarded web-based trading platform. It’s designed for fast and easy trade execution. From the trade ticket, users can quickly make changes, walking through trade ideas where everything is customizable. TradeLAB gives investors a profit/loss/break-even snapshot on a single screen as well as the probability of any profit, based on the current stock price and the current implied volatility. 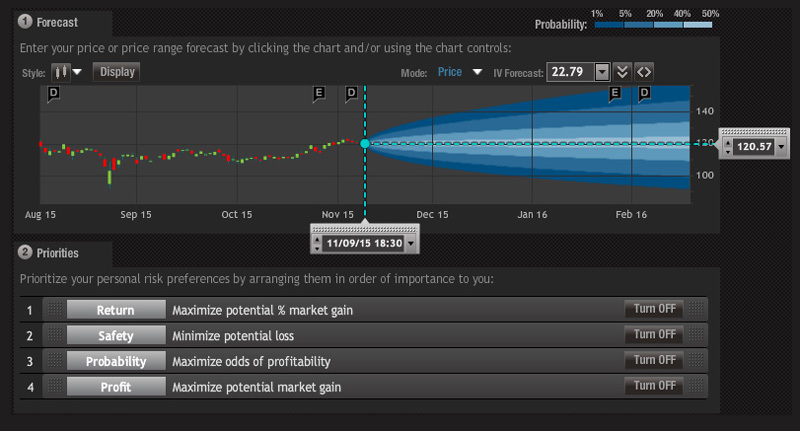 Within tradeLAB, investors can play out “what-if” scenarios for every angle they can come up with. The platform also has significant automation capabilities, including trigger alerts that allow users to pre-populate orders. The platform then pushes an alert to the user when an event is triggered. Investors can then submit already-saved orders directly from the web or via the OptionsHouse mobile app. Another standout tool is strategySEEK, which helps investors scan live market data for options strategies based on specific criteria. The tool turns up a list of matches, allowing the user to quickly create an order, using the above features to analyze the trade within the ticket. On-the-go investors will appreciate that OptionsHouse’s trade platform is browser-based. Any customizations the user makes are saved in his or her profile and available no matter what device is used to access the account. Virtual trading platform: Paper trading (virtual trading without putting real money on the line) is a nice perk for new traders and new-to-the-platform investors. Once customers open a real account (which, remember, has no minimum funding requirement), they can set up a paperTRADE account that mirrors all of the live trading platform’s bells and whistles. Through paperTRADE, investors can get hands-on practice trading virtual currency in a live market environment — a perk that makes OptionsHouse stand out among its peers. Currency trading: Forex investments are not available via OptionsHouse, unlike at competitors OptionsXpress, Ally Invest, Interactive Brokers and TD Ameritrade’s thinkorswim. Commission-free ETFs: Having only five commission-free ETFs is disappointing, but not unusual in the realm of discount brokerages. Active ETF investors who want to keep commission costs down should consider OptionsXpress or TD Ameritrade’s ETF lineups. Mutual funds: OptionsHouse doesn’t have any transaction-fee-free mutual funds, and commissions on funds are midrange at $20. Mutual fund investors will find those costs add up rather quickly. OptionsHouse offers some of the lowest commissions and fees, making it one of the most affordable choices in its competitive set. Its advanced tools and fast trade executions, along with a full-service platform, make it well-suited for options traders. "OptionsHouse stands out among brokerages for offering professional-grade tools at a low price." Although OptionsHouse is not the right fit for mutual fund and ETF investors, it’s hard to beat when it comes to serving options traders and active stock investors at every experience level. Rock bottom commissions (just $4.95 a trade for stocks plus 50 cents per contract for options), $0 account minimum, lack of hidden fees, speedy trade execution and free pro-level investing tools and trading platform are why OptionsHouse continues to show up on our best-of lists.